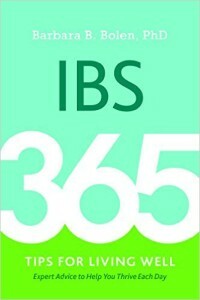 IBS: 365 Tips for Living Well (Demos Health, 2015) offers you practical tips for dealing with all of the challenges of living with IBS each day. A whole book containing the trustworthy advice you have come to expect from me – in little bite-sized nuggets – so that you can easily put into practice what you are reading to help make your stomach issues a thing of the past. 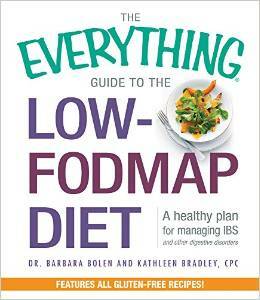 The Everything® Guide to the Low-FODMAP Diet (Adams Media, 2014) is your step-by-step guide for following the low-FODMAP diet – the only diet to have research backing its effectiveness. In addition to tips for ensuring your success on the diet, you will find 150 IBS-friendly, super-delicious and super-nutritious recipes. 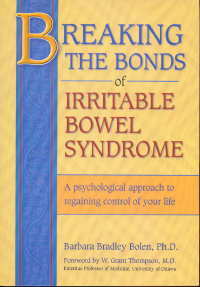 Breaking the Bonds of Irritable Bowel Syndrome (New Harbinger, 2000) offers an easy-to-understand explanation of the factors that contribute to the development of IBS as well as a comprehensive self-help approach to managing IBS symptoms. The book offers research-tested CBT strategies for bringing symptoms under better control.